Do you recognize the athlete in the photo? It’s David Rudisha of Kenya. 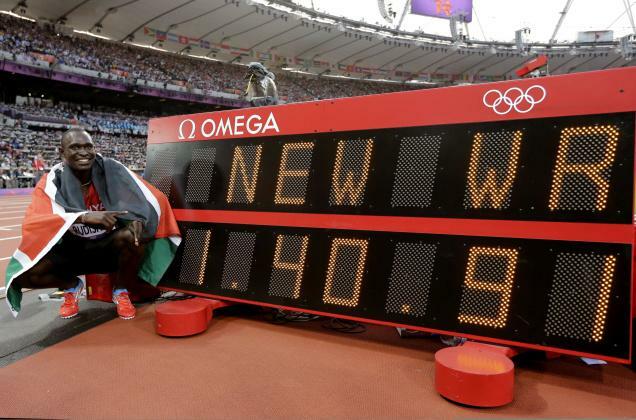 Rudisha, 23, just broke the world record for the 800m for the third time…this time at the 2012 London Olympic Games. If you are unfamiliar with Rudisha, his accomplishments, his face, his story, consider this blog your first introduction to Rudisha and why you’ve never heard of him. Before you read on, go to YouTube and see if you can find a clip of his latest world record performance. Go on! Take your time. As one K-Trax Facebook fan speculated, the IOC made an agreement with NBC giving NBC exclusive rights to broadcasting the Olympic Games. These rights are fine in blocking ABC, CBS, and other major stations from televising the Games; however, these copyrights have also affected broadcasts via the internet. Users on sites such as YouTube have been restricted from posting their favorite performances for all to see and experience again and again. Because of this, users are subjected to visit NBC’s site to view Olympic coverage on-demand. On-demand viewing isn’t so bad…neither is the NBC Olympic page with it’s live streaming and athlete profiles. However, the NBC Olympic page will undoubtedly expire soon just like pages linked to canceled shows. Sigh. Once those pages expire, all of the content uploaded to that page will be inaccessible. At least through social media, videos can theoretically remain accessible and shared throughout online communities worldwide. Accessibility contributes to visibility- an attribute track & field desperately needs to strengthen to remain in the sight of potential markets. With social media, fans from all over can witness over and over and over again the splendor Rudisha’s magnificent run at will. Over time, his name, his style, and the image of him running could be imprinted in people’s memories. 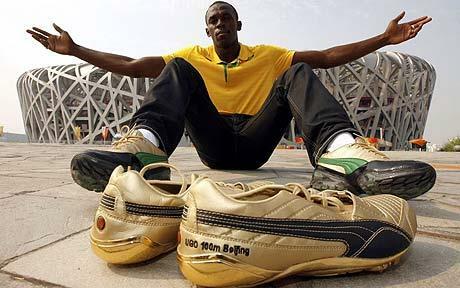 Rudisha could become a household name like Danica Patrick, Travis Pastrana, Shaun White, Allen Iverson, Floyd Mayweather Jr., Michael Phelps, and Usain Bolt. And, when Rudisha runs again, he will have more than just his family and countrymen routing for him. He will have greater support in the stadiums by fans who have traveled from various nations just to see him compete. They broke the 4x100m world record. Their time: 40.82. The former world record of 41.37 was set back in 1985- 27 years ago. That’s almost three decades old. Who set it? The then East German team- Silkil Gladish, Sabine Rieger, Ingrid Auerswald, and Marlies Gohr. If you are unfamiliar with these ladies, check them out on Wikipedia and YouTube. This record of 27 years survived track & field giants Florence Griffith-Joyner, Gail Devers, Chryste Gaines, Ingrid Miller, Gwen Torrance, Evelyn Ashford, Debbie Ferguson, Veronica Campbell, Aleen Bailey, the enhanced Marion Jones, and more. If you are familiar with these names, you are probably wondering, how is this possible? The 4x100m (especially the Olympic 4x100m) is perhaps the riskiest event in track & field. Unlike the jumps, throws, hurdles, vaults, and open runs, risk in the 4x100m heightens by the amount of energy concentrated on the track. Four explosive athletes contained by a single lane must work together as one entity striving for the same goal- to bring the baton across the line first. As the clock ticks, these athletes must put aside their differences, egos, nerves, fears, and apprehensions, and concentrate their power to execute a calculated run as one fluid team. This effort, believe it or not, is an incredible challenge even for the world’s best. The energy on the track is beyond intense and can only be stabilized by successful hand offs. Figuratively, to achieve a successful hand off, energy must be channeled into a plastic or metallic baton and transferred from person to person without disrupting flow. Each leg must be careful not to fumble or drop the baton. They must also be careful not to run over or leave their mate, run out of the zone, accept the baton before zone entry, and pull up prior to the pass. How the baton is accepted, when, and where all affects flow. Anything can happen in the 4x100m, hence why the risks to the finish are high. In past Olympics, some of the greatest sprinters experienced firsthand the risks of the 4x100m; hence, why the former record stood so long. As Carmelita noted in her after-run interview, the US has had problems in the past with getting the baton to the finish. But this time, our women prevailed. Safe hand-offs. Great runs. A memorable performance. Congratulations to Tianna Madison, Allyson Felix, Bianca Knight, and Carmelita Jeter on their extraordinary achievement. First off, congratulations to Gabby and the Fab 5. What an amazing performance. We, at K-Trax, are proud of you. Secondly, the track & field portion of these Olympic Games have officially begun today. Although preliminaries are underway, it’s not too late to file in your Olympic predictions. Below are mine for the 800m. Without a doubt, Rudisha will be the reigning champion in the Men’s 800m. With already two world records in the same event (at only 23 years of age), I think it’s safe to say Rudisha is King of the 800m. Then again, we’ll see what happens at the finish line. Other competitors to watch for are US competitor Nick Symmonds, Khadevis Robinson, Bernard Lagat, and Leonel Manzano. Whew! Too bad there’s no 4x800m in the Olympics. The US has a powerful team. We’ll see if Rudisha can hold these guys off til the finish. The gold is up for grabs in this event. The times are so close, that it’s difficult to determine who will win the 800m this year. With that said, where’s the Myles-Clark family????? Do you have any Olympic Predictions? What are your predictions for the field events, sprints, mid-distances, and distances? Who’s your favorite? Leave a comment.